Violin Concerto No. 5 in A "The Turkish"
Comments: This is the EMI CFP reissue of the coveted ASD 427, which as you can see from above, is one of the rarest and most valuable EMIs in existence. Unless you happen to stumble across a copy at a garage sale, it is unlikely that you will spend any less than several hundred dollars on this album ... unless, of course, you decide to go for this CFP, which is where this review hopefully comes in handy. 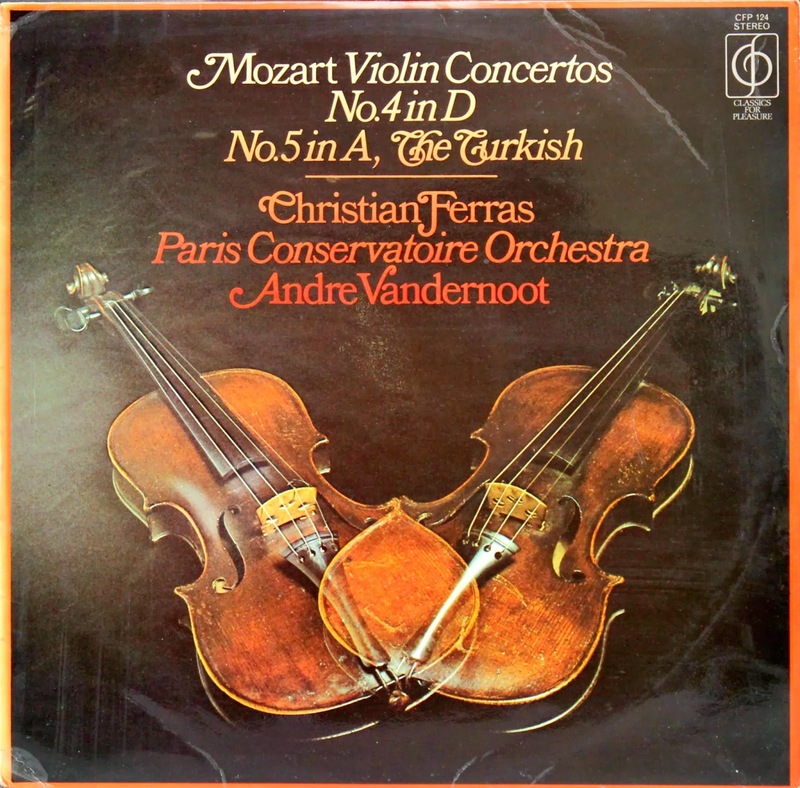 Christian Ferras was in his prime when this recording was made. 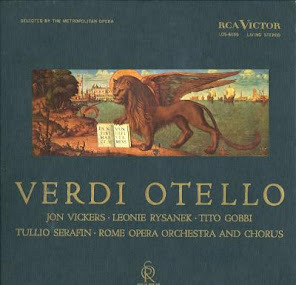 He produces a warm, robust tone on his instrument, and I have always enjoyed his performances on vinyl or CD. 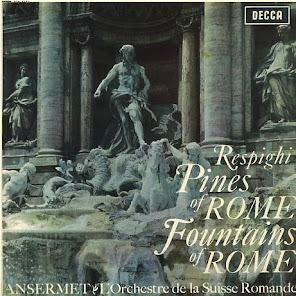 There is, or at least was, a youtube video of a live performance of the Franck Violin Sonata with Ferras and pianist Pierre Barbizet that is definitely worth watching. If you are interested in exploring his art further, I'd strongly urge you to pick up the 4 CD budget boxed set on Brilliant Classics that covers some of his best work with piano accompaniment (mostly for Deutsche Grammophon). Alternatively, there is a 2 CD set on Andromeda Classics entitled "Christian Ferras: The Columbia Recordings" that reissues some of his famous EMI concerto recordings. 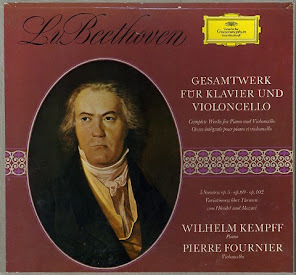 The Mozart concertos are not on either of the two sets, and I have yet to locate this recording on CD. Now on to this LP. 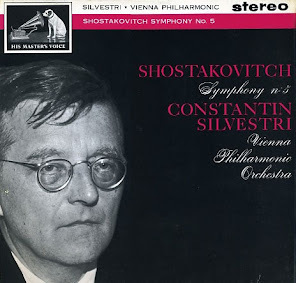 The performances of both concertos are solid and beautifully played. 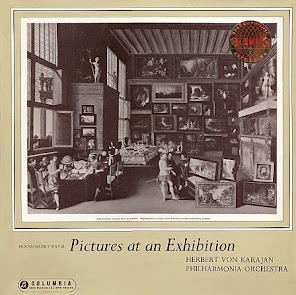 Ferras is placed rather forward in the presentation, and thus you can hear him quite clearly, though I find that he is given precedence over the orchestra. Strangely enough, the orchestra seems like it is squeezed into a small box behind the soloist, so that the soundstage is rather narrow. In fact, I found myself asking whether this album was actually in mono rather than in stereo, but I was finally convinced that this is indeed a stereo issue. 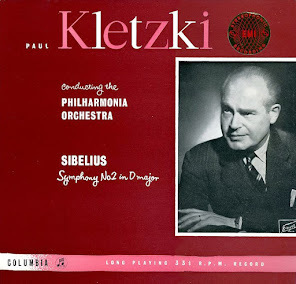 Orchestral clarity is also not the greatest and sets this recording a bit lower on the rankings compared to other versions of the same concertos that I've enjoyed -- Grumiaux on Philips and Oistrakh on EMI, just to mention a couple. Not major issues if you are dealing with a $5 record, but if you are considering the original, just think that you might be spending $500-1000 on this. One might argue that I am listening to the reissue and not the original, but I have my doubts that the original white/gold reissue would solve these problems. If anyone owns it, I would love to hear your thoughts. So, if you are interested in the music and the performance -- which, hopefully, is our common goal -- then let me say that you will be perfectly satisfied with this budget reissue. If you are looking for demonstration sound, look elsewhere. 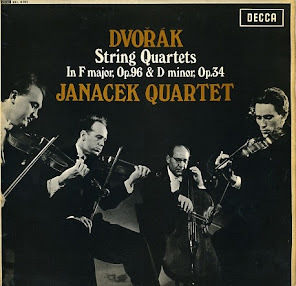 I recall that the Oistrakh recording with the Berlin Philharmonic on EMI had an incredibly lifelike sound with a remarkably wide soundstage. Listened to No. 5 on this, "The Turkish", and I'd say romantic sound and performance. I'd rate it a bit higher than AQL sonically, but overall still a bit disappointing. I hear soundstage width and a pleasing tubey sound. I would imagine the original ASD would do well and might be a strong 4.5. 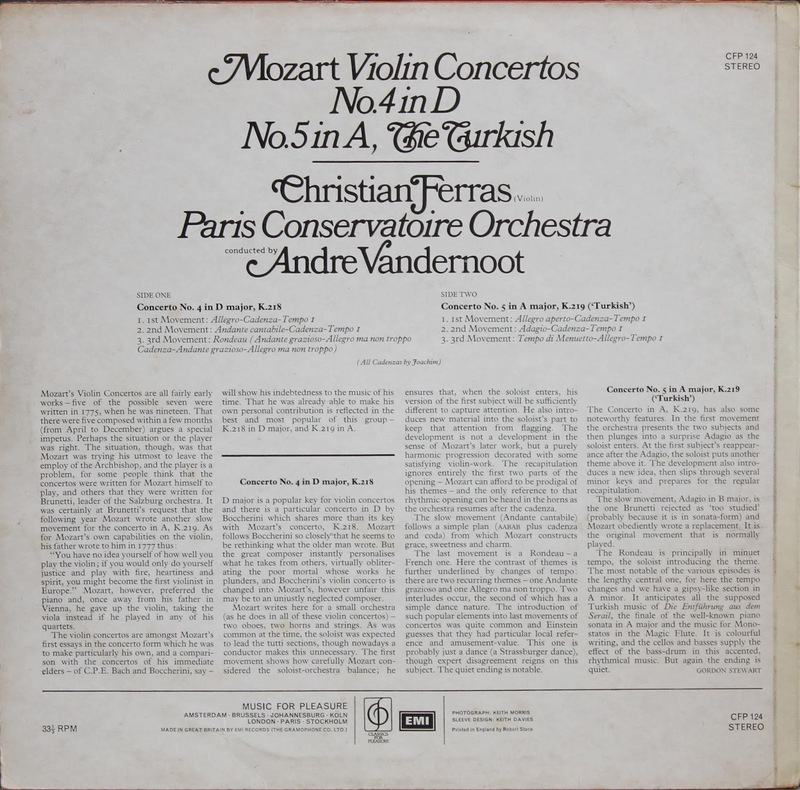 "These capable, but rather matter of fact recordings by Ferras did not stay in the catalogue very long after their issue; there were several better versions around including a strong competitor on HMV in Menuhin. Cool performances; the slow movement of "Turkish" not given enough rein, and the orchestra also accompanying in efficient but detached manner. At the price a reasonable gap filler; by no means by no means a first choice for performance but recording clear and well-balanced."